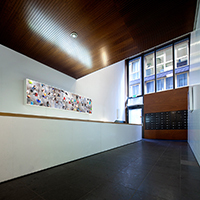 This work is specially made for the entrance of an apartment complex which bares the prominent moniker 'Coffee'. The building, located on the eastern islands off the old harbours of Amsterdam, is part of the new building blocks at the river IJ which have each been named in the manner of the old warehouses which carried the designations of the various goods stored there, such as coffee, cotton, and cacoa. Coffee (33 Min) is a transparency in a light box depicting people who are in transit, moving thru a station hall from one point to another. Upon closer inspection, one notices that many of these rushing figures carry a 'coffee to go' with them. The photo, a collage of images which have been recorded at regular intervals during a span of 33 minutes, attempts to visualize an experience of time in a spatial plane. It illustrates our hurried reality in which coffee is no longer just a shared convivial beverage but an instrumental stimulant that allows people to keep going, now moving alongside each other anonymously with a coffee on the run.